Althaea ficifolia (L.) Cav. ; Althaea rosea (L.) Cav. 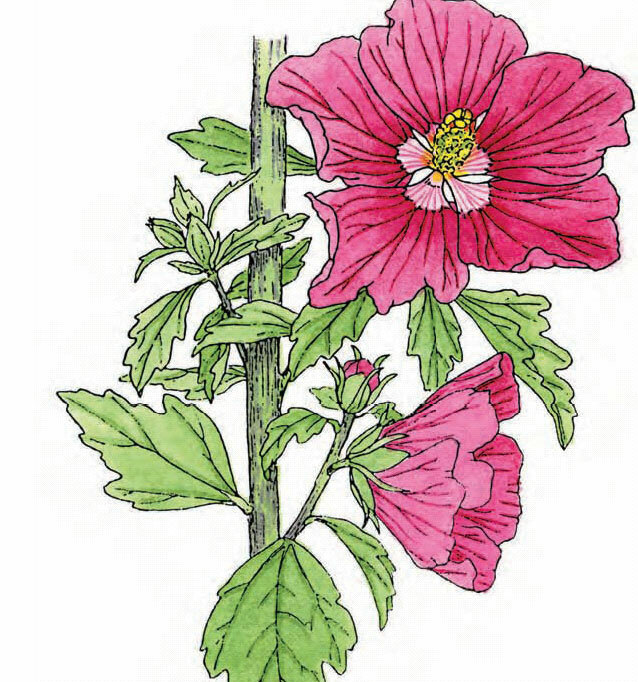 As Zohary notes, biblical scholars suggest both Alcea and Malva as the best candidates for the Hebrew halamuth. Both genera are common Israeli herbs, in early winter, used as edible potherbs. In toto, Zohary argues stronger for Malva than Alcea, and who knows, so many thousands years later, what was meant by these non-botanists of days gone by. Zohary’s picture leads me to believe that he is talking about the same hollyhock that keeps coming up back by my greenhouse, which once was called Althea rosea. Anthropologist Jane Philips says it is one of the most widely used folk cures, both in Lebanon and America (BIB). It is in Zohary’s book that I first saw “the slime of the purslane” (ZOH), and I have personally seen what I call purslane (Portulaca oleracea) on the streets of Tel Aviv. (Ger. ; KAB); Stockmalve (Ger. ; EFS; KAB; USN); Stockrose (Ger. ; USN); Stokroos (Dutch; EFS); Stokrose (Den. ; EFS); Stokross (Dutch; KAB); Thuc Quy (Ic. ; KAB); Ungerblume (Ger. ; KAB); Varita de San Jose (Cuba; Dr.; AHL; RyM); Varra de San Jose (Sp. ; JFM); Weinrose (Ger. ; KAB); Wetterrose (Ger. ; KAB); Winterrose (Ger. ; KAB); Zhanba (Mongolia; X12795226). DEP; GMH); Diuretic (f; DEP; EGG); Emollient (f1; BRU; GMH); Expectorant (f; EFS); Febrifuge (f; DEP; LMP); Fungistat (f; FNF); Gastroprotective (1; FNF); Hypoglycemic (1; WO3); Refrigerant (f; DEP); Stomachic (f; LMP); Vasoprotective (1; FNF). Tenesmus (f; DEP); Thirst (f; PH2); Tumor (f; JLH); Urethrosis (f; JLH; PH2); Vaginosis (f; EGG). Young mucilaginous leaves cooked and eaten; flower petals, raw or cooked, and cooked flower buds also eaten; black hollyhock petals useful for imparting deep colors to teas and wines. Roots yield an edible starch (FAC; TAN) 1–2 oz mucilage (DEP). 1–2 g fl/teacup (PH2). 1.5 g fl/100 ml water as mouthwash (PH2). Arabians drink the sweetened floral tea for cough (GHA). Arabians use leaves in collyria and poulticed onto abscesses (GHA). Brazilians apply the leaves to inflammation (JFM). Chileans apply the root decoction to tumors (JLH). Costa Ricans take floral infusion for cough and sore throat (JFM). Gypsies pound roots with honey, taking 2x per day to prevent miscarriage (BIB). Lebanese mix juice with powdered coffee, soot, spiderwebs, or sugar to stop bleeding (BIB). Middle Easterners apply mucilage to bruises, or with dough and olive oil to tumors (BIB). Peruvians poultice leaves, cooked in oil or milk, on swellings (EGG). Peruvians use sudorific decoction for cough and bloody vomiting (EGG). Peruvians use fresh leaf decoctions in douches (EGG). Peruvians use steam from floral decoction for earache (EGG). Punjabi use flowers for rheumatism, the root for dysentery (KAB). Class 1 (AHP). No health hazards known in conjunction with the proper administration of designated therapeutic dosages (PH2).